The free biscuits and Wi-Fi plus nearby golfing are just a serving of the tasty treats at the pet-friendly La Quinta Inn Davenport. The two-story La Quinta Inn provides 113 rooms that feature free Wi-Fi and local calls coffeemakers and cable TV. Guests are welcome to enjoy the daily complimentary breakfast which includes waffles bagels and biscuits and gravy. 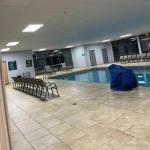 Fitness lovers can work out in the gym and splash in the heated indoor pool. The hotel provides on-site laundry facilities for guest use and offers free parking. Pets are welcome for an additional fee. Within five miles of downtown Davenport La Quinta Inn is nestled northeast of the city just off I-74. Golf-lovers can enjoy a few rounds at either Duck Creek Golf Course less than one mile south or Palmer Hills Golf Course under a 10-minute drive east. Less than three miles west guests enjoy shopping at NorthPark Mall. The hotel is also conveniently located within four miles of St. Ambrose University and eight miles north of Quad City International Airport. Dogs of all sizes are allowed. There are no additional pet fees. There is a pet waiver to sign at check in. Dogs must be leashed and cleaned up after.